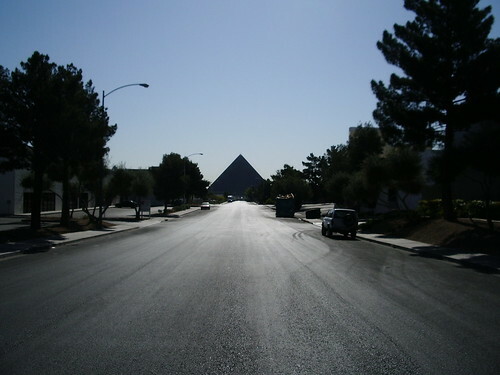 The gigantic glass Pyramid of Luxor Hotel and Casino, in Las Vegas, popularly known as the Luxor Pyramid is the largest modern day 'true pyramid'. It may be noted that two more structures, namely Ryugyong Hotel (under construction, 330 m / 1087 ft), North Korea, and Transamerica Pyramid (260 m / 853 ft), San Francisco are often cited as the tallest pyramids but these have lesser volume than the Luxor Pyramid and are also not 'true pyramids'. The base of Ryugyong hotel is large equilateral "Y" with three wings gradually tapering as these go up. The base of Transamerica tower, though squarish in shape has small width of about 45 m (148 ft) as compared to its over all height and it looks more like a lean tower than a pyramid. Moreover two of its side have lift well protruding out, with the result it is not uniform on all its four sides. 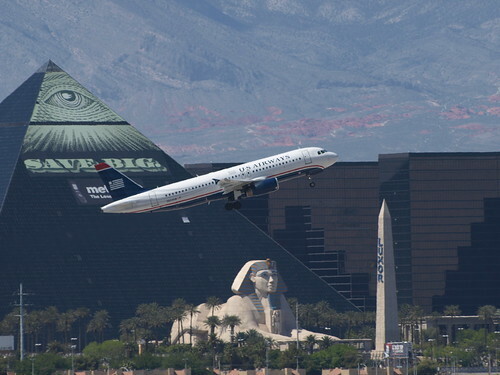 On the other hand the Luxor Pyramid with a base width of 196.90 m (646 ft) and a height of 106.68 m (350 ft) is a true pyramid with all its side as true isosceles triangles. The Luxor Pyramid may be the largest pyramid of the modern times, yet it is still smaller than the Great Pyramid of Giza, which has a base of 230.4 m (756 ft) and height 146.5 m (481 ft). 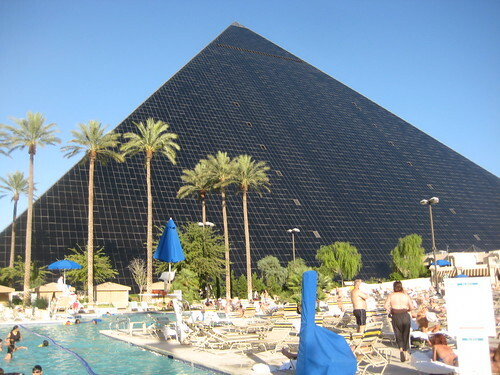 Designed by architect Veldon Simpson and interior designer Charles Silverman, the 30-story pyramid walls are made of black glass and the sloping walls are lined with guest rooms which are reached by travelling in the "inclinators" which travel at an angle of 39 degrees. 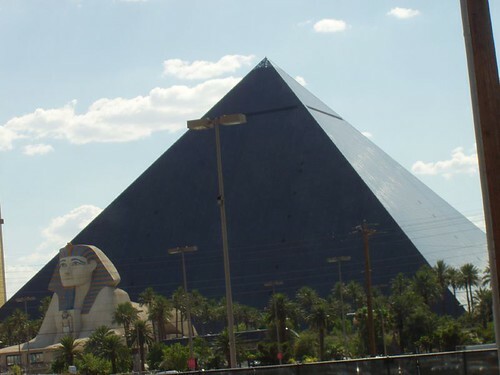 The decor of the interior of pyramid hotel and casino is based on ancient Egyptian theme and the frontage has huge 34 m (110 ft) high sculpture of the Great Sphinx along with a 43 m (140 ft) tall obelisk. The atrium inside the pyramid with volume of 820,000 Cu. Metres (29 million cubic feet) is the largest in the world. 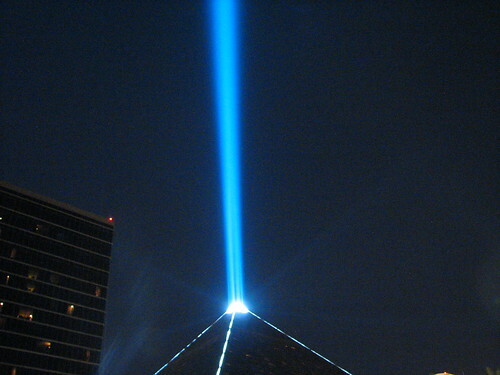 The top (tip) of the pyramid has powerful spotlight pointing upward to the sky. Made up of 39 Xenon lamps and focussed into one intense, narrow beam, it has a brightness of 42.3 billion candle power and is claimed to be strongest man-made beam in the world. It is lit up in the night and draws thousands of silvery moths giving the top an eerie silvery look.